Similar images looks at the similarity of the image itself, as opposed to keywords. Let’s go through an example, because I think it’s neat. 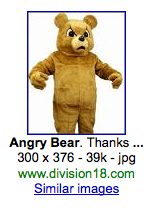 Here’s one of the top results for “angry bear”. So, that’s pretty good. 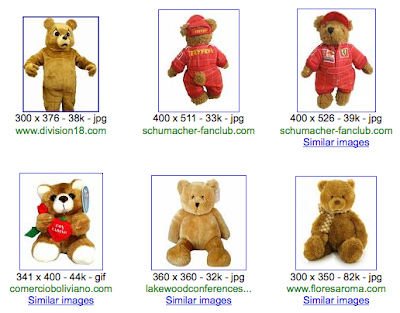 Google managed to figure out that the bear I’d clicked on, was, in fact, not a real bear. But it didn’t come up with more guys in a bear suit – only a few teddy bears. Still, it is useful. Here are some similar image results for “Ottawa” (the image farthest to the left if the one I clicked on for “similar images”). It’s pretty fun to play around with, but not revolutionary.